The new Rainmate IL has two LED lights on the inside to illuminate the water and also use as a nightlight, It has two light settings for high and low to go with a blue tinted water basin for a beautiful night-time hue. 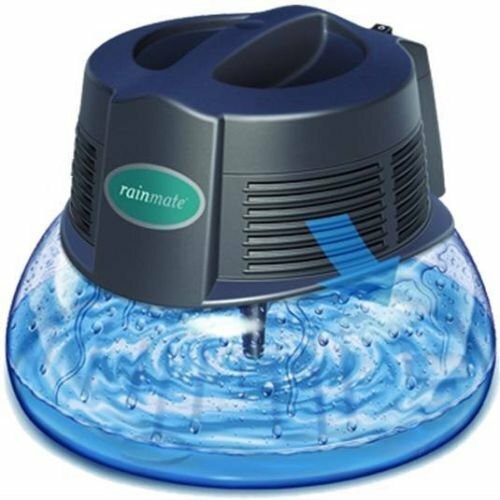 The Rainmate uses water, to trap dust and odors, returning only naturally clean, water-washed, gently scented air to your home environment, Sanitizes and washes air with water. Sanitizes and washes air with water, Can be used for aroma therapy and has multiple uses. Add any of Rainbow's many concentrated fragrances to the water and bring the sweet and refreshing smell of nature into your home with RainbowÃ¢â'¬â"¢s collection of fragrances. It plugs into a regular 110 volt outlet. The Rainmate has an on/off switch so you don't have to plug and unplug the unit. If you have any questions about this product by Rainbow, contact us by completing and submitting the form below. If you are looking for a specif part number, please include it with your message.